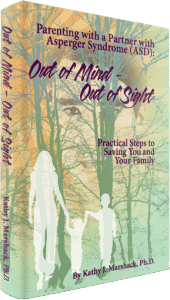 Out of Mind—Out of Sight – Kathy J. Marshack, Ph.D.
as Dr. Marshack explains the science behind these troubling relationship as well as state of the art theories on Asperger Syndrome (ASD). At the end of the book Dr. Marshack provides specific techniques to help readers implement the changes they want and need to make to revive their marriage and their parenting as well as reclaim their personal freedom. To receive a complementary copy of a chapter from Out of Mind—Out of Sight, subscribe to our newsletter below. We’ll give you instructions to get your free download.